Offering you a complete choice of products which include 40 ft open top shipping container. By keeping track of latest market development, we are actively engaged in offering superior quality range of 40 Ft Open Top Shipping Container. 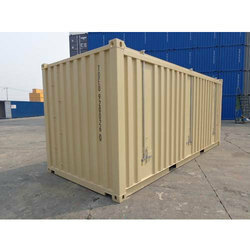 These containers are used for storing and transporting machinery, sheet glass, and other heavy, bulky or long objects. The product goes through a stringent quality check by our adroit professionals before they are delivered to customers to ensure its quality and performance. We offer these at market leading price and ensure timely delivery of the product.